37 mm 70-K14 х 1 pcs. 37 mm V-1114 х 2 pcs. Chapayev — Soviet Tier VIII cruiser. A light cruiser with powerful artillery, built under the "Big Fleet" program (Project 68). The ship was slightly slower than her predecessors but significantly surpassed them in armor protection. During her upgrade, the cruiser received considerably enhanced AA defense. While slightly slower than its predecessor Shchors and carrying the exact same set of guns with only a touch longer range, the Chapayev sees improvements in most other respects. Her armor is upgraded from "virtually nonexistent" to "weak", she sees a significant boost in hit points, and her AA suite roughly doubles in effectiveness to a competent but not spectacular level. The most intriguing addition is the long-range (11.7 km) Russian radar, available upon acquiring B hull. Judicious use can make for major plays on capture points by allowing the team to dislodge or destroy erstwhile hidden enemy destroyers. This combines well with the extra stealthiness enabled by the new upgrade slot. Relatively thin ship causes many overpenetrations when hit by battleship AP. Excellent all-round guns with nearly no flaws. Good firing angles when moving towards target. Long-range radar that reaches longer than ship's detection range with Concealment System Modification 1 ( ) equipped and Concealment Expert on her commander, meaning captains can surprise other ships with radar without being seen. Armor, while improved, is still only average. Citadel remains very large. 152 mm HE cannot penetrate armor >25 mm (including Hipper, Baltimore) without IFHE captain skill. The damage output of her main battery is not improved over the predecessor. Less than optimal firing angles when kiting away. Massive turning circle and average rudder shift. Large size makes her easier to hit. Fast but extremely short-ranged torpedoes are only useful as a weapon of desperation. B hull should be researched first for the radar. After that, only the fire control system remains. Given her turning radius and range, some captains may prefer to equip Steering Gears Modification 3 ( ) into Slot 5 and play Chapayev exclusively at long range. The increased rudder responsiveness will make her a more difficult target to captains who stay alert to incoming fire. Key skills for Chapayev commanders include Priority Target, Adrenaline Rush, Superintendent, Demolition Expert, Concealment Expert, and Inertia Fuse for HE Shells. 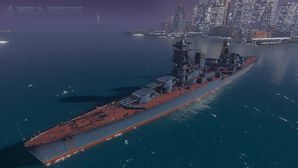 Players who wish to spend doubloons can equip Chapayev with Type 18 camouflage that lowers her detection radius, reduces the accuracy of incoming shells, reduces her repair costs, and increases the amount of experience she earns. Chapayev also has an alternate premium camouflage called "Svyatozar", in which she appears as she does during the Halloween scenario "Sunray in the Darkness". The Chapayev (Чапаев) class were a group of cruisers built by the Soviet Navy during and after World War II. Seventeen ships were planned but only seven were laid down before the German invasion of the Soviet Union. Two were destroyed when their shipyard was captured by Germany and the remaining five were only completed in 1950. This page was last modified on 19 February 2019, at 08:18. This page has been accessed 70,049 times.